I visited Christine, a friend I’ve met off the internet, up in her home town of Newtownards on the weekend of May 5 and 6. The weather was fantastic and we managed to get out and about and see quite a lot of the country side. Unless you are completely blind the first thing you notice when driving into Newtownards is the Scrabo tower located on a nearby hill. 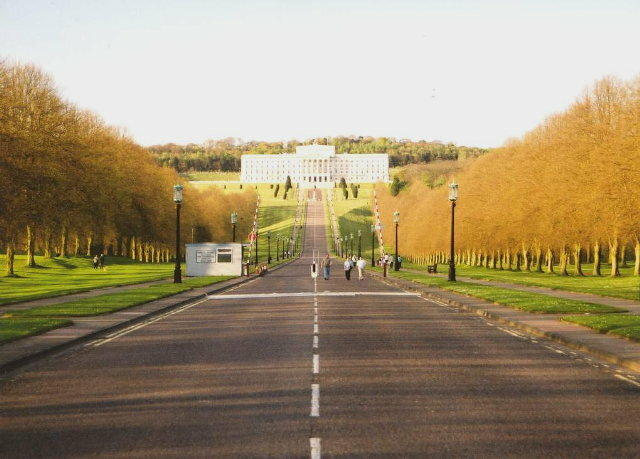 It was built in 1857 as a memorial to the Third Marquis of Londonderry. There are 122 steps inside which take you up the tower on the right hand side and up to the viewing area. From the top you can see Belfast in one direction and out over the sea to Scotland in the other. A family used to live in the tower and make cups of tea for vistors. Now it is filled with educational material about the tower and the surrounding area which is now a park. There is even a life size model of a dinosaur that was believed to have lived in the area in the Triassic era. They have only ever found a foot print of the beast. The picture below is a panorama of almost 360 degrees, so it is quite wide! The base of the tower is on the left, followed by Newtownards, the airport, Strangford, Lough, farmland, a golf course, Belfast in the distance, more farmland and finally the tower again. Please click on the image for the full size version. 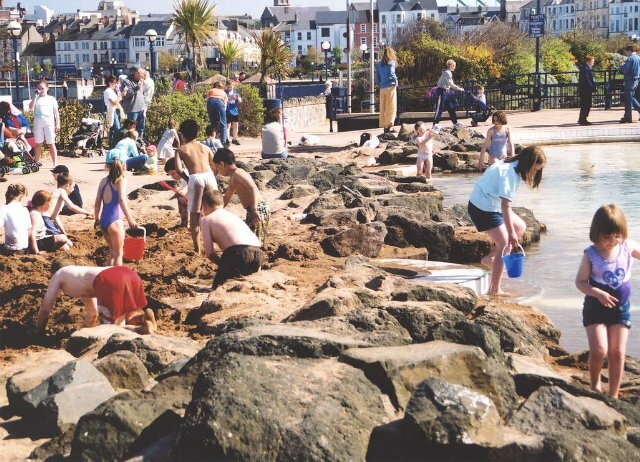 The town of Bangor is a lovely sea side community. 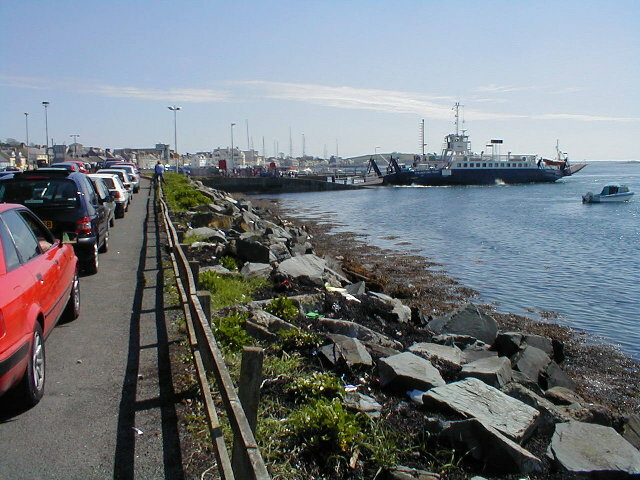 The picture below is a panorama taken at the marina, from the Pickie Park (see below) side, looking back towards the town. Again, please click on the image for the full size version. 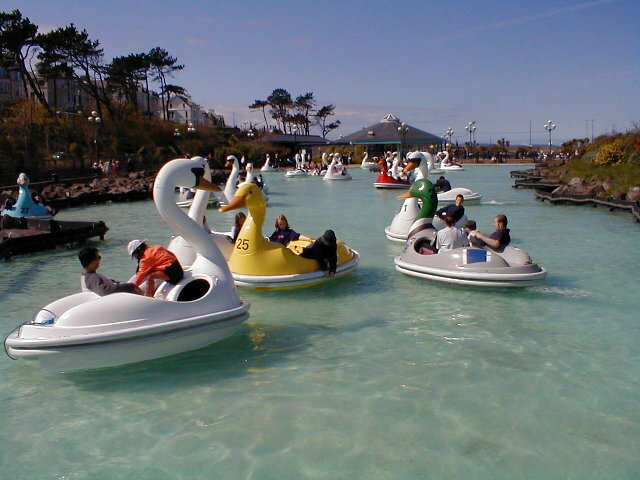 The Pickie park is a small park with these swan boats for people to peddle around in, a model train ride and a paddling pool and sand pit. Great for the little ones and those that don’t want to grow up :-). No I did not go in the the swan boats, swim or make a sand castle, but I did want to go on the train ride. Just kidding! 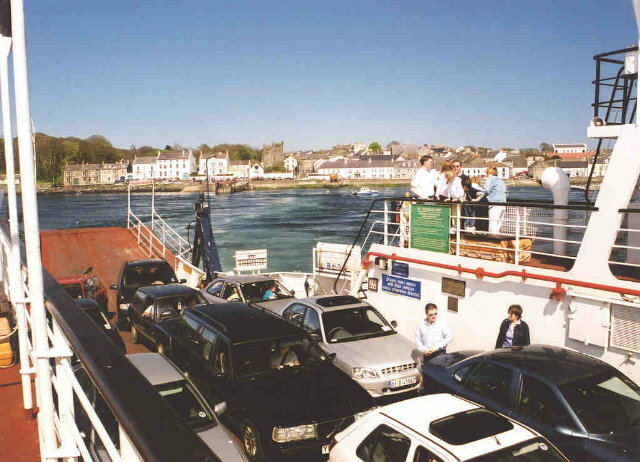 The following day we headed off to the east of Newtownards with the aim of driving down the coast and getting the ferry across the Lough at Portaferry and Strangford. I was amazed the the caravan parks along the side of the sea and that people would even want to spend anytime there at all! They are everywhere and there is nothing to do there, it’s just awfully boring! Oh well, when you don’t know any better I suppose it is nice :-). 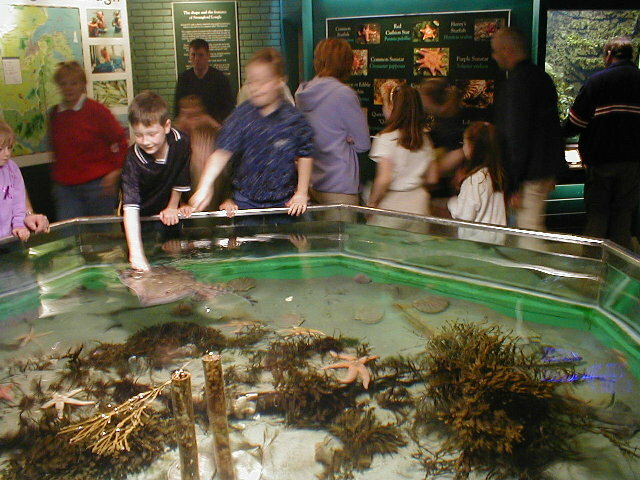 When we got to Portaferry we went to the Exploris aquarium, which had some displays of fish from the local area as well as some from other places. On the way back to Newtownards we came across an Orange march! You can’t really see, but they do have orange sashes. 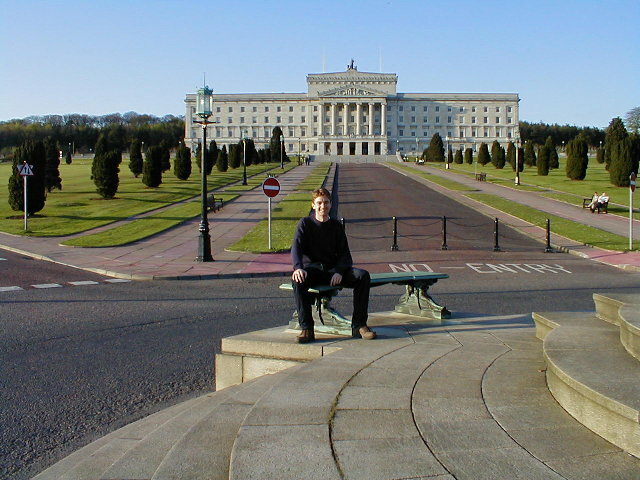 In between Belfast and Newtownards lies the Northen Ireland Parliament. Takes a while to walk all the way to the top! 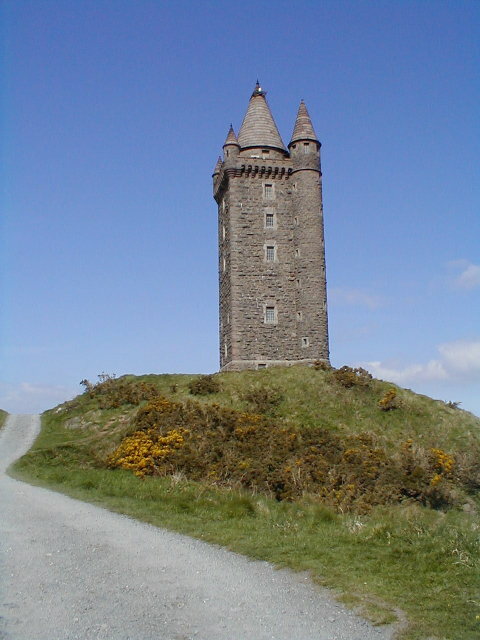 This entry was posted in Northern Ireland, Travel and tagged Newtonards, Scrabo Tower on June 14, 2001 by louco73.